The play "Yoshitsune Koshigoejô" was originally written for the puppet theater (Bunraku) and staged for the first time in the 7th lunar month of 1754 in Ôsaka at the Toyotakeza. It was a revision of two early plays, Namiki Sôsuke's "Nanbantetsu Gotô no Menuki" (1735) and "Yoshitsune Shin Fukumijô (1744). The title, which suggested that the play focused on Minamoto no Yoshitsune, was in fact dealing with the siege of the Ôsaka Castle, led by Tokugawa Ieyasu to destroy the Toyotomi clan in 1614 and 1615. This play was quickly forbidden because of the 4th act in which Gotobê's wife fired a gun at Yoritomo (this was of course interpreted as an attack on the Shogunate). "Yoshitsune Koshigoejô" was revised in 1770 by Toyotake Ôritsu, who completely rewrote the 4th act for a puppet production at the Kitahorieza in Ôsaka. Regarding the adaptation of this drama to Kabuki, the very first one was was staged in the 11th lunar month of 1754 at Hoteiya Umenojô's theater in Kyôto as the kaomise drama "Fûkigusa Aioi Genji" [more details]. 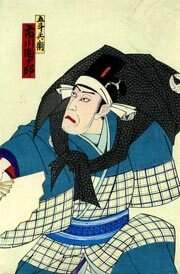 The script (unknown playwright) was similar to "Yoshitsune Koshigoejô"'s one but there were a few differences, the most important one was the name of the strategist (Gotobê in "Yoshitsune Koshigoejô", Tôsaku in "Fûkigusa Aioi Genji"). It was staged under the title of "Yoshitsune Koshigoejô" for the first time in the 12th lunar month of 1761 in Ôsaka within the precincts of the Tenma Tenjin Shrine (unknown casting). The Edo audience had to wait up to the 9th lunar month of 1790 for the first production of "Yoshitsune Koshigoejô" in this city; it was staged at the Ichimuraza as the onagori kyôgen of the Kamigata star Asao Tamejûrô I [more details]. "Yoshitsune Koshigoejô" was a 5-act drama. "Goto Sanba" is the opening scene of the 3rd act. The war between Minamoto no Yoshitsune and his elder brother Minamoto no Yoritomo, the military dictator who rules Japan with an iron hand, is imminent. Izumi no Saburô, a faithful retainer of Yoshitsune, has been trying to recommend a man called Gotobê as Yoshitsune's military strategist. At the same time, two others retainers of Yoshitsune, Nishikido no Tarô and Date no Jirô, are plotting to undermine Yoshitsune's power by leading him to enjoy the pleasures of life. At the opening of the curtain, a lighthearted dance is being performed in the presence of Yoshitsune. This dance was instigated by Nishikido and Date as part of their evil plan to bring Yoshitsune's downfall. A young samurai forces his way into the party, his face being partially hidden with a mask. This sudden intrusion makes Yoshitsune angry and the two evil retainers unmask the man. He is Kamei no Rokurô, one of Yoshitsune's young retainers, who desperately tries to alert his master by bringing up the subject of Yoshitsune's attitude. Yoshitsune is indignant at Kamei's indiscretion and angrily leaves the room, leaving Nishikido and Date to punish Kamei. A fight is about to ensue when Izumi no Saburô appears on stage to appease Nishikido and Date, and also to calm Kamei. He tells everybody that the strategist Gotobê is about to arrive here soon to meet Yoshitsune. Nishikido and Date know that Gotobê has the reputation to be a great drinker. Their plan is to make him drink a lot before his meeting with Yoshitsune. If they succeed in turning him into a miserable drunkard, both Gotobê and Izumi will be definitively discredited. Gotobê arrives on stage. He does not look like a master of strategy. Date is the first one to greet him and sake is brought to be served to Gotobê, who is not at ease in this palace. His meeting with Yoshitsune is extremely important and he prefers to turn off the invitation to drink. Nishikido joins the two men, urging too Gotobê to drink, saying that the sake has been selected by Yoshitsune specially to please Gotobê. The man sticks by his resolve not to drink, but the two evil retainers decide to lead Gotobê into temptation by starting to drink the sake themselves, commenting its excellence, noisily smacking their lips, and bringing the sake fragrance near Gotobê's nose. The poor visitor can't bear it anymore and he finally accepts to drink a little cup. Unfortunately for him, one sip leading to another, urged by Nishikido and Date to drink more and more, he is soon completely drunk. He falls into a drunken sleep and Nishikido and Date leave the room in full satisfaction for their plan is a success. Yoshitsune enters the room in order to meet the sleeping Gotobê. He is followed by Izumi, Nishikido and Date. The two evil retainers wake Gotobê up, informing him that Yoshitsune has arrived. However, Gotobê is too drunk to realize anything. Izumi is shocked to witness Gotobê's drunkenness, but immediately understands that it is the result of Nishikido and Date evil deeds. 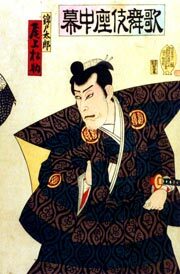 He asks Yoshitsune to cancel the meeting until Gotobê sobers up, but Yoshitsune leaves the room in anger, ordering this pathetic drunkard to be thrown out of the palace. Nishikido and Date order servants to throw Gotobê out. 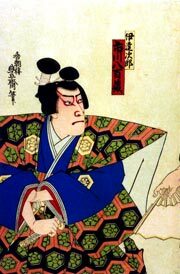 Izumi realizes that nothing can be done right now with such a drunkard, so he decides to retire and wait for another opportunity to introduce Gotobê to Yoshitsune. A group of actors, dressed as takeda yakko, arrive on stage. They hold wooden sticks to chase Gotobê out of the palace. Some humorous negotiations start with the drunkard, who agrees at the end to dance the sanbasô, an auspicious dance, for the servants. An appropriate costume is provided and the music can shift to the rhythm of the sanbasô. Gotobê and the takeda yakko go through a series of hilarious pantomimes followed by a lively tachimawari. A group of takeda yakko finally forms a horse, using a bucket of water as the head of the animal. Gotobê rides this unusual horse to make a triumphant exit by the hanamichi.